A scrum master bears a pivotal role, as a focused facilitator, a coach and a servant leader in an Agile development team. Scrum masters are responsible for monitoring progression towards goals through daily stand-ups and frequent “check-ins”. Scrum masters also have to ensure that the morale of the team is always intact and resolve any issues that may arise during the course of the project. In companies that haven’t fully transitioned to Agile, there isn’t always a clear understanding of who a scrum master really is. 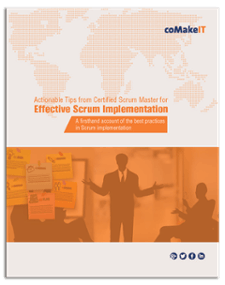 That’s why we have put together this list of tasks that a scrum master must do in order to be effective at his or her job. Download this Ebook to get a firsthand account of the best practices in Scrum implementation in Agile software development!